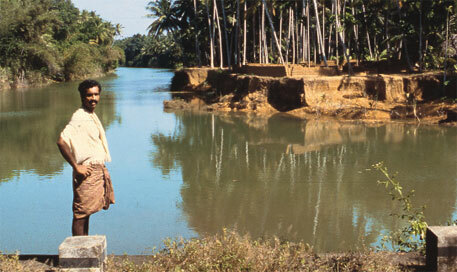 THE Kerala government seems all set to give up its commitment to protect wetlands and paddy fields. The Congress-led United Democratic Front (UDF) government in the state has decided to make “necessary” amendments to the Kerala Conservation of Paddy Land & Wetland Act, a stringent legislation that was passed unanimously by the state assembly in 2008. It has also decided to regularise all conversions and reclamation of paddy fields and wetlands prior to 2005. The decision was taken on Febru- ary 8 this year, but kept a secret. The matter came to light when environmental activists obtained a copy of the minutes of the cabinet meeting in the first week of July through Right To Information Act. The government has not, as yet, clarified how the legislation would be ame-nded. But going by the state government’s track record, environmental activists fear the legislation would be diluted to favour realtors and industries. Under the legislation, reclamation of wetland is completely prohibited. The Act also prohibits leaving paddy fields fallow or using them for any other purpose without the permission of district-level and state-level monitoring committees. “The inte-ntion behind this decision is dubious,” says V S Vijayan, former chairperson of the Kerala Biodiversity Board. He feels the decision could be a precursor to a programme to be launched by the government in September to attract global investors in various sectors. The government’s justification is that those who had used paddy land for residential purposes have been left high and dry since there was confusion about the status of the land. Kerala Chief Minister Oommen Chandy says he has received numerous complaints from people who constructed houses by reclaiming five to 10 per cent of their paddy land with permission from the district collector, as was allowed in the Act, but in records the status of the land is paddy field. But the government could not justify the haste. It did not even consult several Congress leaders and other political parties within the ruling front. A few Congress leaders like V M Sudheeran and T N Pratapan strongly opposed the cabinet’s decision. A UDF meeting held on July 16, after the news about the cabinet meeting leaked, recommended the enaction of another comprehensive law and asked the government to withhold the decision to regularise reclamations prior to 2005 for the time being. The 2008 legislation was enacted because of severe rice shortage and groundwater scarcity in the state. The State Planning Board figures show Ker-ala lost 566,000 hectares (ha) of paddy land between 1975 and 2007. 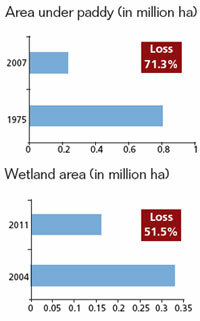 Half of the wetlands in the state disappeared between 2004 and 2011 (see graphs). The Act made it mandatory for each village panchayat to prepare data banks on wetland and paddy fields within three months after it came into force. But nothing happened for two years. “Now, when all the 978 village panchayats are ready with their data bank, the government has decided to amend the Act,” says S Usha of Thanal, a Thiruva-nanthapuram based non-profit that promotes organic rice cultivation. The main reason for the loss of wetlands and paddy fields was the spurt in real estate business and their reclamation for industrial and residential purposes. “All this happened when the Kerala Land Utilisation Order was in force,” points out Harish V, the environmental activist who passed on the minutes of the meeting to the media. Issued in 1967, in the wake of a famine, the order prohibits conversion of land under food crops for other purposes. But Harish points out that the order does not say anything about wetlands and fallow fields. The state government has been capitalising on this loophole to reclaim vast stretches of wetlands for various projects, he says. Parts of the 203,300 ha Vembanad lake, an internationally important Ramsar site and the largest wetland system in India, have been reclaimed by the government for endeavours like Goshree Project, bridges connecting mainland Kochi to the islands north of the backwaters. High Court has made it clear that preservation of paddy and wetland act of 2008 cannot be implemented with retrospective effect and that conversions prior to the implementation of the act in 2008 cannot be considered illegal. The databank prepared by the Dept of Revenue at the time of 2008 act implementation clearly lists the status of the property at that time. The government has to honor land fillings done prior to 2008, as indicated by the High Court. We can blame the government only if it honors land fillings done illegally after the 2008 act was implemented.